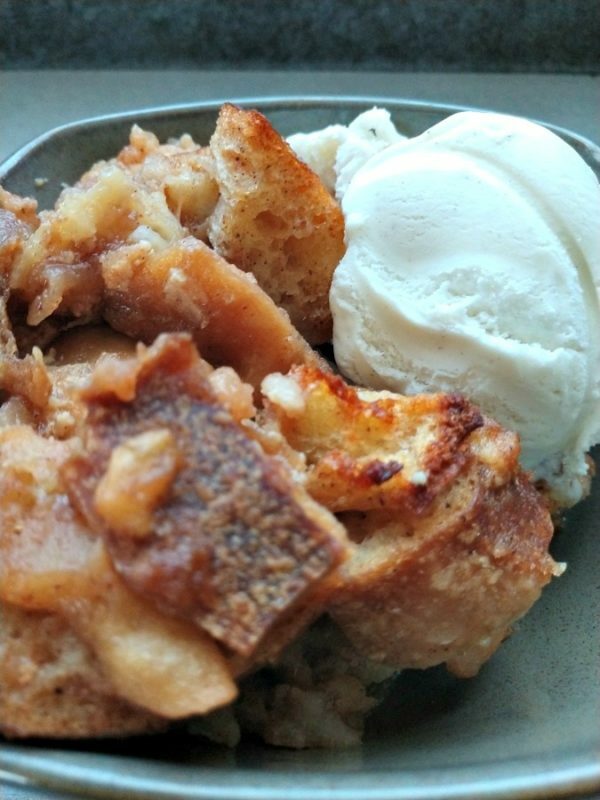 Bread pudding in my opinion is best made with a bread that has a hard crust. I prefer French Bread sliced into cubes for my bread pudding. I like using Panera’s French Bread. It comes in a long loaf and has a smaller thickness. It also gives me a reason to drive into town since there isn’t a Panera locally. Bread pudding is very easy to make. Once you have everything prepared, allow the bread to sit to soak in the liquid. This can be a couple hours or you can fix the bread pudding the night before. Leave the baking pan in the refrigerator overnight and cook the next day. You can also substitute a prepared can of apple pie filling instead of making your own. My kids enjoyed this warm with a side of vanilla ice cream. Just like warm apple pie! 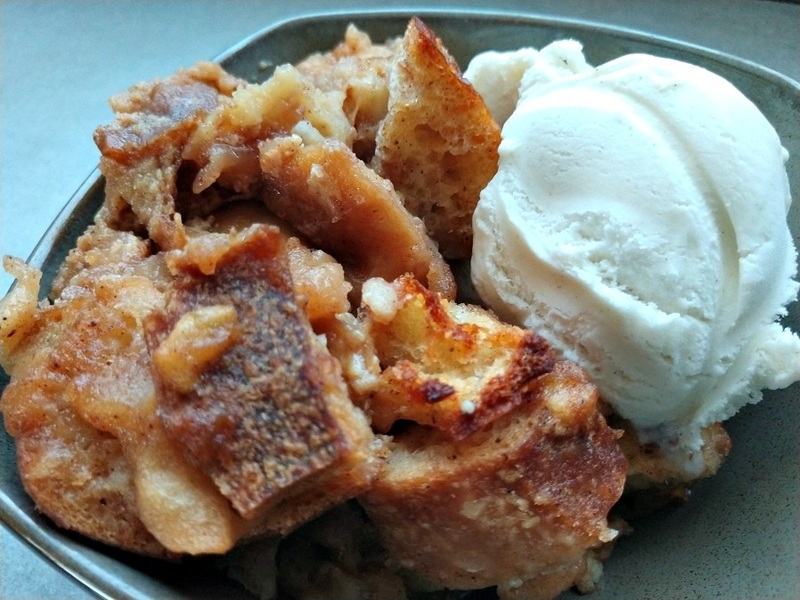 Taste of apple pie in a bread pudding. Topped with a scoop or two of vanilla ice cream. In a skillet on the stove, add the ingredients for the apple pie filling. Stirring as the apples cook until the sauce thickens. Or substitute 1 can of store purchased apple pie filling. Add the cubed bread to the bottom of a 5 or 6 qt slow cooker or a casserole slow cooker. In a medium mixing bowl, whisk the ingredients for the bread pudding. Pour the liquid over the top of the cubed bread tossing the bread to coat as you pour. Spoon the apple pie filling over the top of the casserole. Toss to mix the apples in with the bread. Cover and cook on LOW for 3 hours or until the middle has set.